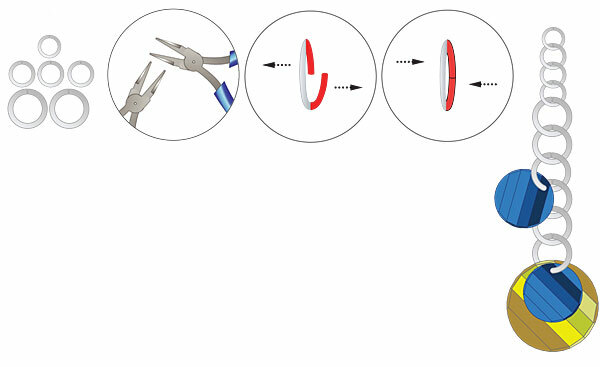 Open a 12mm jumpring using flat-nose pliers and slide on the Swarovski pendant article 6621 28mm crystal tabac and article 6621 crystal Bermuda blue B as shown in the illustrations. Open three more 12mm jumprings and slide onto one of them a Swarovski pendant article 6621 18mm crystal Bermuda blue B and connect all jumprings as shown. Add two more 12mm jumprings, three 8mm jumprings and one 7mm jumpring. 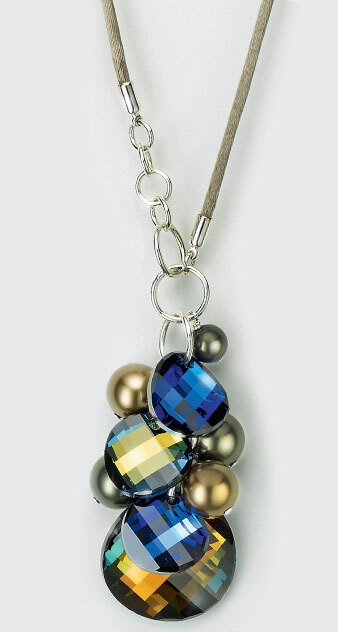 Slide one Swarovski crystal pearl article 5810 8mm crystal dark green pearl onto a headpin, form a loop, but do not close loop completely, (you will need to open the loops to attach to necklace in Step 6) and cut off the excess using side-cutters. Repeat this step 4 more times. Cut 70 cm of 2mm satin thread. Glue cord ends onto both thread ends. Use tweezers to help push ends onto cord. Open a 7mm jumpring. 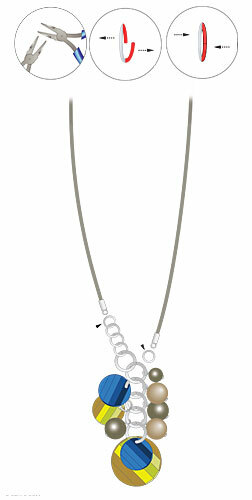 Slide on one Swarovski pendant article 6621 18mm crystal tabac. 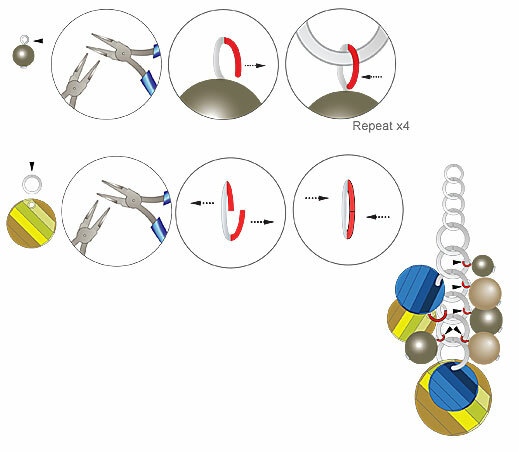 Attach pearl headpins from Step 4 to jumprings as shown in the illustrations. Open a 7mm jumpring and attach to one cord end. Open another 7mm jumpring. Attach it to the other cord end and to the created "Dazzle" pendant as shown. Close jumpring. Make sure all jumprings are closed securely.